Printable Formatted 8.5x11 Publicity Photo or right click the above photo for a higher resolution version of that one! 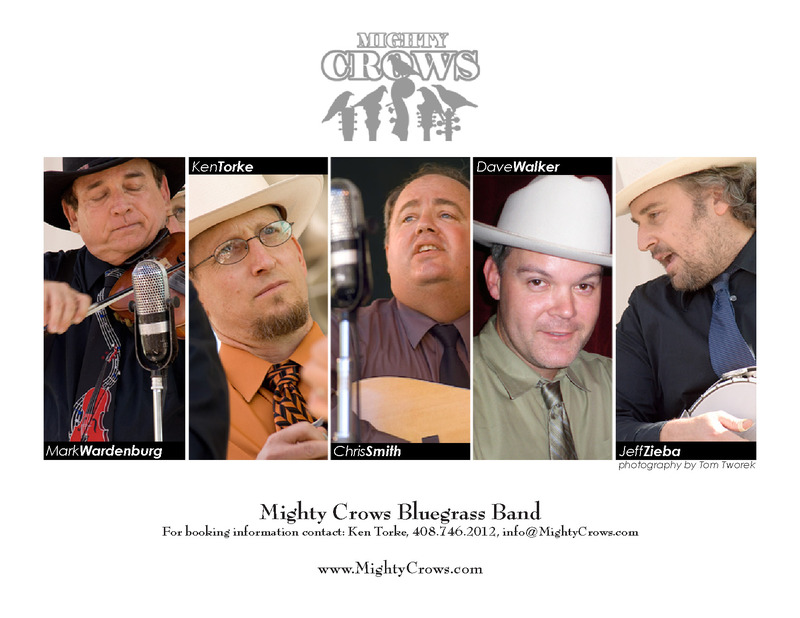 The Mighty Crows is a Bay Area bluegrass band with a traditional style and repertoire reminiscent of the seminal bluegrass acts of the ‘40s and ’50s. The band is built around the powerful trio singing of Chris Smith (guitar), Jeff Zieba (banjo), and Mark Wardenburg (fiddle). Dave Walker keeps the bass thumping and front man Ken Torke plays mandolin and keeps things moving as they gather around a single mic. The Crows made their first public appearance at the 2004. They've since appeared at a growing list of events.The Crows have been performing to rave reviews at venues and festivals from Etna to Sanger including the San Francisco Old Time and Bluegrass Festivals, Wolf Mountain, Kings River, Plymouth, and Good Old Fashioned. They've played cozy bars like the Riptide and on concert stages such as the Redwood Bluegrass Associates and the Freight and Salvage. They have appeared on radio shows such as Ray Edlund's Pig in a Pen (KPFA Berkeley), Peter Thompson's Bluegrass Signal (KALW, San Francisco) and Mike Russell's Monday Night Bluegrass (KKUP, Cupertino) and were featured on Stranger Music, a weekly, alternative-music series airing on KMVT Television (Mountain View). Check out our list of gigs and come visit us some time. You can also join the email list by contacting the Crows. Mark Wardenburg: Mark's baritone fills out most of the Crow's trios, although he drops down to bass for the gospel crowtets. He's plays a fine fiddle and is having fun. Ken Torke: Ken plays the mandolin, does most of the MC work, sings an occasional lead for the Crows, maintains the web site and agitates for the cause. Chris Smith: Chris cranks out leads and high tenor harmonies for the Crows. He plays rhythm guitar and even takes a break or two. Dave Walker: Dave plays banjo with the Homespun Rowdies and is way into the bluegrass. He wanted to put in some time on the bass and we're happy to have him. Jeff Zieba: Jeff plays banjo (and accordion) and sings lead and is occasionally called upon to sing baritone. The Crows have been lucky enough to have several pals who play bass. We shure would like to send a tip of the hat to every one of them. Alex Mayers: Alex left the Crows but remains forever in our hearts. Bruce Cambell: Bruce plays with a bunch of bands and fills in for the Crows on occasion. Dave Walker: Dave plays banjo with the Homespun Rowdies and thumps bass for us now. John Kael: John plays everything well and helped out the Crows for a year or so. Paul Knight: Paul is sound man and bass player extrordinaire, but he lives far away. Roz Lorenzato: Roz is our most attractive bass player.